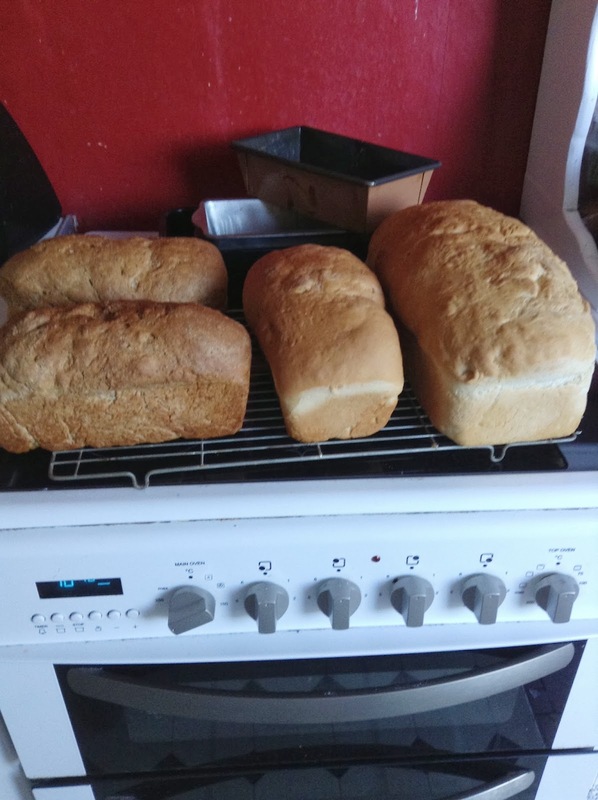 I have been making bread, lots of bread. In June my little sister and I did a two day bread course. Which was lots of fun. On our first day we made Malted Fruit Bread and Rich Bread Plait. Then the following week we made Pitta Breads and Easy Bread Loaf. 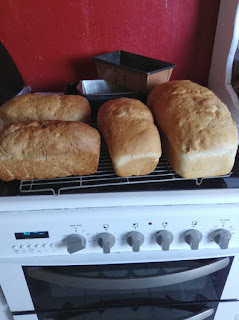 Since then all I have been doing is batch baking bread, its so easy. Our teacher explain that you don't need it to be hot in the kitchen, yeast will grow in the cool. So if you make your bread in the evening and put it in a bag and fridge it, the bread will rise over night, then just cook the bread that day. SIMPLE!!!!!!! So here is the recipe for the Easy Bread Loaf. 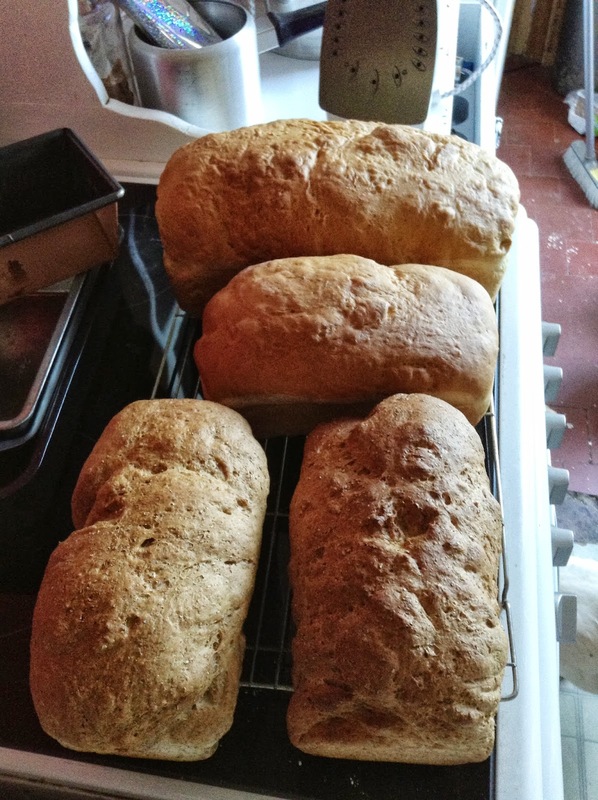 500g granary, strong wholewheat or white flour. 7g of fast action dried yeast or fresh if you have it. 1 tablespoon of clear honey. Tip the flour, yeast and salt into a large bowl and mix together with your hands. Stir 300ml hand hot water with the honey and oil, then stir into the dry mixture. Oil the loaf tin and put the dough in the tin, pressing it out evenly. Put in a large plastic food bag and leave to rise. Once it has risen to the size of the tin ( and a bit more, mine looked like a giant mushroom) and it no longer springs back its ready for the oven. Heat the oven to 200C OR 180C for fan ovens or gas 6. Then bake in the middle shelf for 30-35 minutes. Tip it out onto a cooling tray and tap the base of the bread to check it is cooked. It should sound hollow. Leave to cool and enjoy. If you want to make a large loaf of bread just double the ingredients. So far I have made white bread, wholemeal bread, granary bread, wholemeal with seeds bread, all using this recipe. And I have made white rolls with the recipe. All I did was to cut the dough into 8 pieces, round to make a ball shape then place on to a large baking tray, cover with a large food bag and left it to rise. Cooked it at the same. They came out as crusty rolls..... delicious. Thanks for stopping by ... see you soon and lets all make bread!!!!!!!! !